The first thing I taste is a salty seasoning blend of garlic and onion, but with a light tangy wisp of citrus. The chewing brings on the soy sauce flavor, along with a touch of chile pepper. There's a light bit of heat building, while the natural meat flavors come through. As for being marketed as "Hot", it certainly has some heat, but more at what I would defined as, "medium" on our heat scale (level 3 out of 5). It's enough for spicy food lovers to enjoy, and enough to make them feel as if they're getting what they were promised. But for folks who don't like spicy foods, this is outside your range. 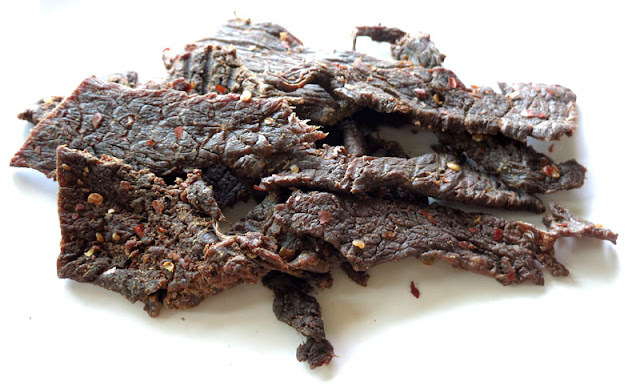 Otherwise, the primary taste profile is largely a salty seasoning blend of garlic and onion, with a noticeable chile pepper. The soy sauce and a light tangy citrus remain in the background, as does the natural meat flavor. The meat consistency seems great. 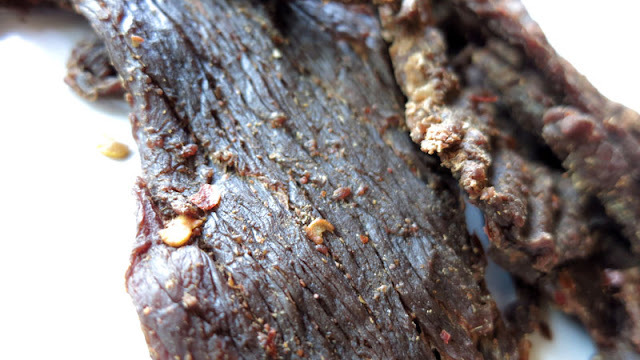 It appears to be pieces of pure meat, with little to no fat visible. It's on the dry side, but not too terribly, and retains some chewiness. The texture is meaty, with a little bit of steak-like feel, yet some pieces have a bit of a mush character. This Famously Hot from Two Brothers Jerky delivers a fair amount of heat enough to satisfy a spicy food lover yet keep things toned down for a satisfying snacking experience. I found increased flavor in this variety compared to the company's Bull City Original and Sweet Ginger Teriyaki. I particularly like the red chile flavor that comes out of this, and the light tanginess in the chewing. 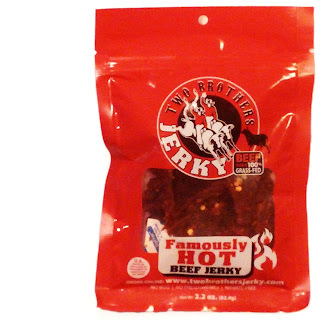 This is certainly Two Brothers' best flavor.